So, you’ve just finished installing RollBack Rx Pro or Reboot Restore Rx Pro (formerly Drive Vaccine) on your End User machines. It’s configured just how you want it, you’ve ran your initial tests and the program is working fine. You’re about to settle back in at your desk with a fresh cup of coffee when you realize there’s one final step left before you can call it a day – installing the RMC, the free centralized management tool. Luckily, installatiing and running the RMC is as easy, if not easier, than setting up the program itself. After reading this quick guide I’m sure you’ll feel confident using this tool. To start with, when you download either of the two programs from our site, the .zip file will contain a second folder identified as the “(Program Name) Remote Management Console”. Be sure to unzip this folder if you downloaded the program, and then open up the folder. Simply run the Setup.exe Application. The x64.exe Application should be reserved for failed installs while running the Setup.exe. Installing the RMC does not require a reboot. So don’t worry about that. Simply follow the on-screen instructions and you should be finished with the installer in just a few seconds. Please ensure that you are installing both the Service and the GUI. Next up is to run the RMC itself. Open up the program from the newly created desktop icon, and you’ll be greeted with an intro screen requesting a username and password, as well as the Server IP and port. By default, this will be set to the local machine ip (127.0.0.1) and Port 9000. If you’re running the RMC from this same computer, these default settings are sufficient. If you are running the server control portion on another PC, please enter that computer’s IP address or Machine Name to connect through. NOTE: The username and password requested here are not the same as the ones set for the end users. By default, the username is Administrator and the password is left blank. Simply click on Login to enter into the RMC. 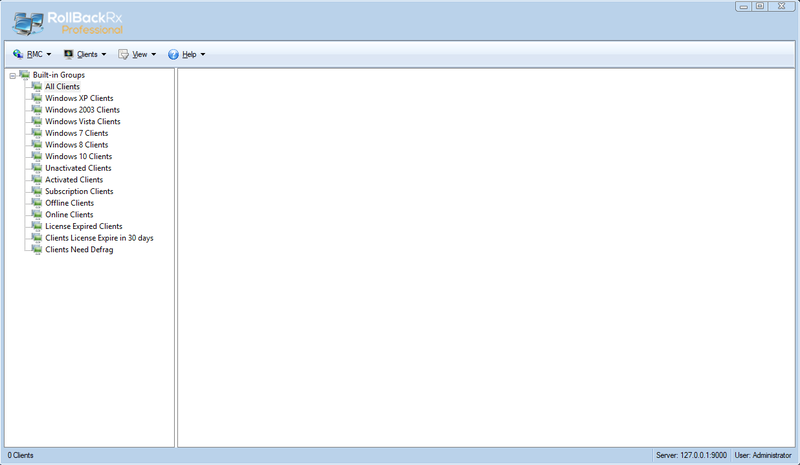 Now we're in, and as you’ll see the RMC tool is quite simple in its layout. There are default groups located on the left-hand side, with a display (which can be visually changed to suit your preferred style) on the right-hand side highlighting all the connected PCs. Users which are online will be colorful, while users who are offline will appear greyscale. 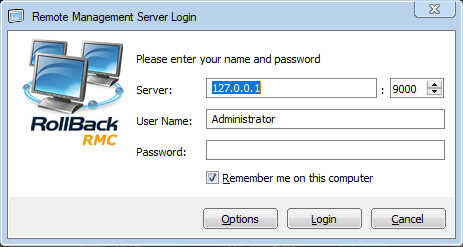 The first thing a Network or System Administrator may want to do is set up a Username and Password for the RMC itself. To do so, click RMC in the top-left corner and select User Management from the drop-down menu. A new window will appear with the current Administrator being listed. If you wish to start creating other Administrators or Users with variations in their permissions, simply click Add and fill out the requested properties. To change the settings of existing users, highlight the user and select Properties, or select Change Password to update the password. Do remember by default the Administrator has no password, so you may want to update it immediately to include one. Now that our users are configured, it’s time to start setting up our workstations. The first thing we should do is place the end users into the appropriate group. By default there are several built-in groups which divide the clients, by their Windows OS, Activation status, whether or not they are currently online or offline, and a single group containing all clients. If you'd like, you can also create groups by right-clicking whitespace on the left-hand menu and selecting “Add Group”, or clicking on RMC and selecting “Add Group” from the drop-down menu. Complete this action by giving the group a name, writing in a description and selecting OK. Adding clients into your group can be done by dragging and dropping the clients into the appropriate group. Removing clients can be done the same way, or by right-clicking the desired PC and selecting “Remove from the Group” in the drop-down menu. Deleting groups can be done from the RMC menu as well, or by right-clicking on the group and selecting “Delete Group”. Grouping PC's together makes general management of the clients within that group much easier. You have your Administrator permissions set and the PCs connected, placed in the appropriate group. Now you are in control to manage the machines as you please. The RMC can be configured to issue out commands to individual PCs by highlighting one, right-clicking, and selecting one of several options available, i.e. taking a new snapshot, rolling back the system, deleting snapshots, defragging, issuing commands, sending files, remoting in (Windows enterprise needed), shutting down, restarting, locking the screen, or completely changing the configuration of RollBack Rx Pro or Reboot Restore Rx Pro’s settings by selecting “Client Settings” from the menu. 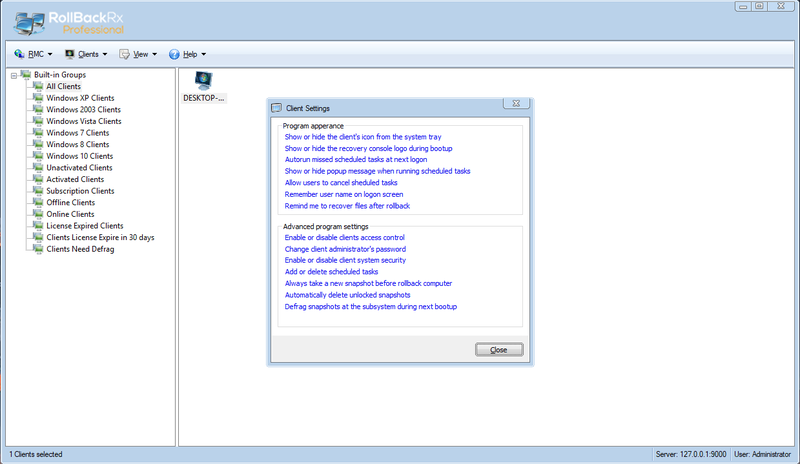 As you can see, the Client Settings menu gives you full control over the function of the program, from its appearance to the end user down to the functioning of the program. This is one of the most useful tools the RMC has, as it allows for quick changes to be issued to connected users on the fly without the need to physically go to each machine. These can be issued individually, to groups, or to all connected machines at the same time. Administrators may want to stay informed in regards to the program and we offer two tools to provide insight: 1. The Alert Settings, and 2. The Event Logs. The Alert Settings can be found by selecting the RMC button and clicking “Alert Settings” from the drop-down menu. Once selected, a new window will appear presenting a few different options for an email to be sent out to the administrator such as if the client has been offline for a certain number of hours, or free space is getting low on the drive. 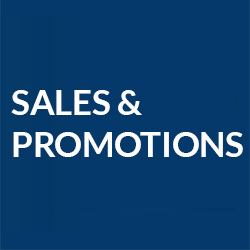 By entering in an active email address the RMC will issue information based on these options, keeping the administrator up to speed on all of the connected clients. Keeping an eye on the functions of the RMC and its connected PCs can be done through the Event Logs. This information is key when troubleshooting any issues. The logs can be found by selecting the RMC button and clicking “Event Logs” from the drop-down menu. 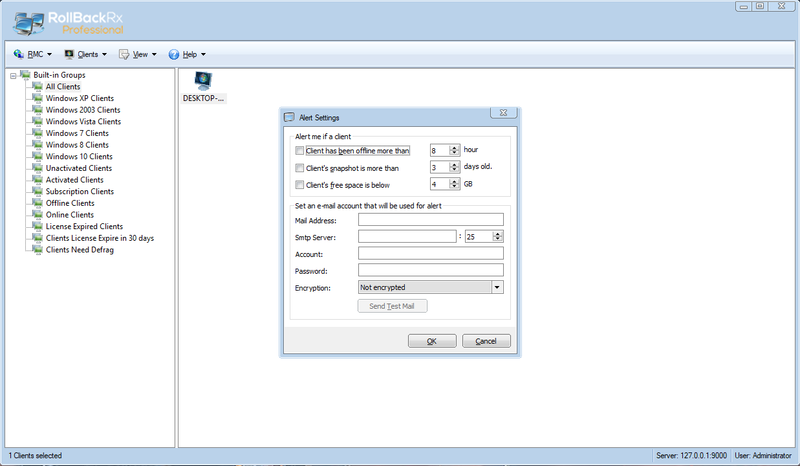 Selecting “Save As” will export the data into a “.log” file, which can be sent around easily to whoever may need it. Finally, we come to exporting client information. 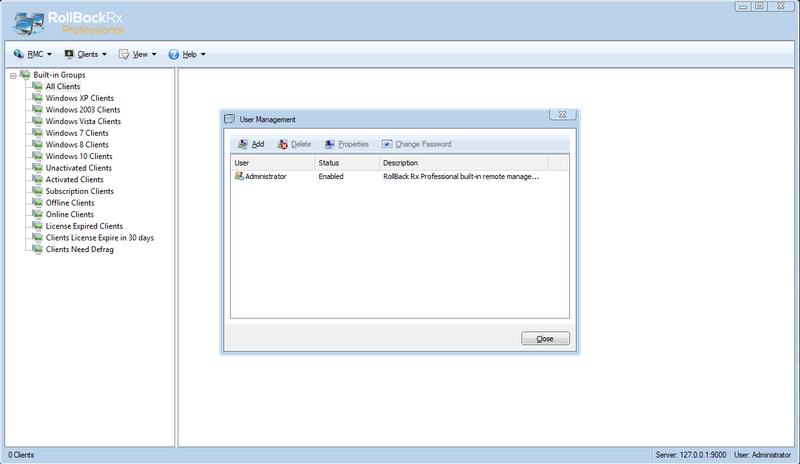 The RMC allows for users to export all connected client PC information into an XML file. This can be found by selecting the RMC button and clicking on “Export client to XML” from the drop-down menu. From here, the administrator needs to write in a name and choose a save destination, then click Save. NOTE: After you export the XML file, you can change the file type to .CSV which may make the data more readable. If you’ve come across an issue you still don’t understand after reading through the this Starter Guide as well as the appropriate program's User Guide, then feel free to get in touch with the support team here, or by calling in at 1-800-496-0148.